WIRELESS STREAMING TO ANY AUDIO SYSTEM: Wirelessly stream music from your smartphone or tablet to any speaker or stereo set. Our Bluetooth adapter provides an easy and convenient connection so you can enjoy your music unrestricted. HI-FI SOUND WITH 3D SURROUND: The latest Bluetooth 4.2 technology allows for Hi-Fi transmission, guaranteeing you the best quality audio. It also has support for 3D audio, which gives you the ultimate surround sound experience. Simply click on the ‘3D’ button after connection to switch the feature on/off. EASY TO SET UP: Setting up your connection is very easy and straightforward. Connect the Bluetooth stereo adapter to a power source, then connect it to your music system via a 3.5mm jack or RCA cable. Finally, pair the Bluetooth receiver with your Bluetooth enabled device. You are now all set! 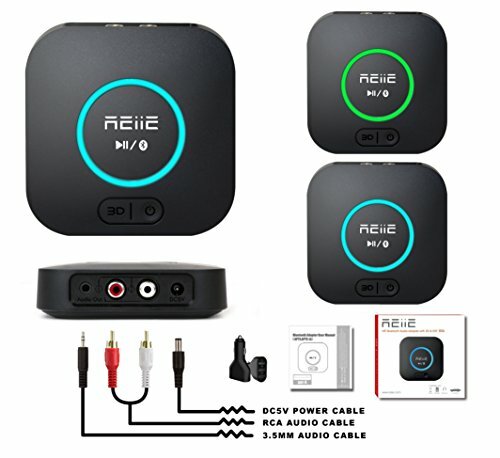 DUAL BLUETOOTH CONNECTIVITY: Our Bluetooth audio receiver can pair with two devices simultaneously, allowing you to play music from either one of them. This is handy if you have different playlists on you phone and laptop, making easy to play music from either device without disconnecting the other. WORKS WITH VOICE COMMAND MODULES: Do you have Alexa or Echo? Great! This wireless stereo adapter seamlessly connects with them, allowing you to easily control your music using voice commands. With this, you can truly enjoy a wireless experience. If you have any questions about this product by REIIE, contact us by completing and submitting the form below. If you are looking for a specif part number, please include it with your message.